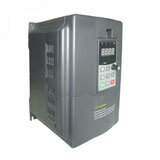 GK3300 Series economic low cost 2HP Non-Enclosure variable frequency drive (VFD, also named AC Drive, Frequency Inverter) with compact design, it's the best choice for integrate system solutions. 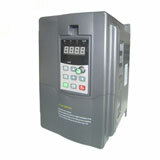 As there is no cover, the VFD price is extremely cheap. You can install multi drives into a big cabinet, which is very useful in textile machines and other highly-integrated applications. Since this non enclosure VFD being manufactured by Gozuk, it has been widely applied in weaving machines in textile industry in local China and global countries. Compact size, light weight with stable performance and cost efficiency. 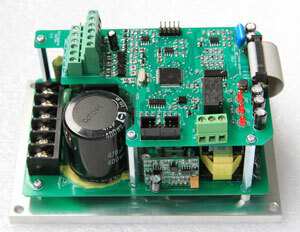 Adopt latest technology of SVPWM (Space Vector Pulse Width Modulation). Built in dynamic braking unit. 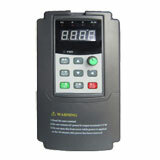 Integrated standard RS485 communication terminals, support Modbus communication protocol. 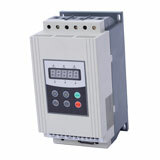 multi-phase PLC control, multi-velocity control, more accurate and convenient. Sensorless vector control, output high torque in low frequency. V/F control with 7 types of V/F curve, constant torque V/F curve, custom define V/F curve, down torque V/F curve. Support multi-frequency deploy ways: digital setup, analog quantity setup and communication setup. Built in faults recording function. Showing operating, stopping and failure status by led indicator lights. 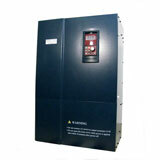 Adopt jump frequency control which prevents mechanical resonance and makes the system more stable and reliable. Adopt central frequency switch function which let the end user to fix the central frequency while it's necessary. Textile machines, winding machines, printing and packaging industries, etc.